Southern Fried Design Barn is a full-service design studio and southern-inspired gift company based in Nashville, Tennessee. Owned and operated by graphic designer, Amy Kinslow. Amy offers graphic design services including logo design, product design, social media graphics and much more. SFDB’s gift company ranges from stationery products, art prints, gift tags, zipper pouches, shirts, and kitchen towels. Sold retail and wholesale, SFDB is currently carried in over 200 stores nationwide. Amy graduated Middle Tennessee State University with a Bachelor of Fine Arts in graphic design. She has held corporate designer positions for Fortune 500 company, Country Music Television and for the gift industry leader, C.R. Gibson. Her work has been featured on the CMT Music Awards, in Southern Living Magazine and sold in T.J. Maxx, Target and Staples. In addition, she has collaborated on gift products for Nashville restaurant, The Loveless Cafe (read story here) and ABC’s The Chew star, Carla Hall and her Brooklyn, New York based restaurant, Carl Hall’s Southern Kitchen, (read story here). Since a very young age, Amy knew she wanted to be in the art field for your life career. Growing up on a cattle farm in Middle Tennessee, Amy understood hard work and also learned to appreciate the priceless things in life; such as, summers outdoors, family, and her faith. The stories her grandparents and parents would share about their life growing up never grew old to her. In college, she began to really take interest in southern history and culture. It helped to revive those family stories she was told as a child. SFDB products are proudly designed and printed in Nashville, Tennessee. 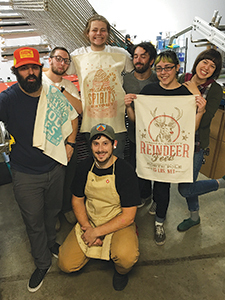 Amy has teamed up with local silkscreen studios and printers to help produce products. Many of our kitchen towels and shirts are still hand-silkscreened today. Not only are you supporting Amy when purchasing a SFDB product but you’re also supporting these fellow Nashville artisans and businesses as well. In addition, all our paper goods are printed on premium 100% American Made stock from the French Paper Company in Niles, Michigan. This 6th generation family-owned paper mill’s stock is 100% post-consumer, FSC certified, and created by renewable energy with hydroelectric generators. Using American made products and keeping our production close to home is important. We are so grateful to have been featured in these fine publications! If you would like to feature us or a product please contact Amy atamy@southernfrieddesign.com.